In recent months God’s been impressing on me that we, as His followers, are undefeatable. Seriously—we have access to a lot more power than we realize. Here’s how I know this is true. When we place our faith in Jesus Christ for salvation, He indwells us through the person of the Holy Spirit. Imagine what this looks like! He moves in and takes up residence in our lives. Christianity, then, isn’t so much our needing to strive to be good or to be holy. No. It’s about Christ living His life in us Galatians 2:20. It’s about our surrendering to His purposes and plans rather than clinging to our own. And it’s about experiencing His victory over temptation and hopelessness rather than succumbing to them and falling into defeat. Satan will shoot his fiery darts at us. He’ll do his level best to bring us down and destroy us, but he can never defeat us because Christ is in us and He is God. 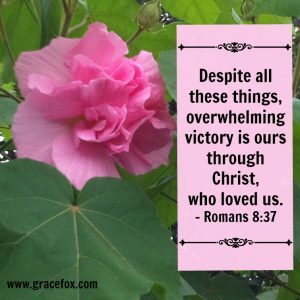 “No, despite all these things [betrayal, disappointment, loneliness, terminal or chronic illness, accidents, financial setbacks, loss and grief, fear, etc] overwhelming victory is ours through Christ, who loves us” Romans 8:37. We don’t win by a slim margin, folks. We experience overwhelming victory. We cream the enemy when he wages war against us. Do I hear an amen? How does this truth make a difference for you today? To Which Voice Should We Listen? Just shared post with my whole small group of 22 ladies! Great post! Thanks for doing that, Nancy. I trust that they’ll all find it encouraging!